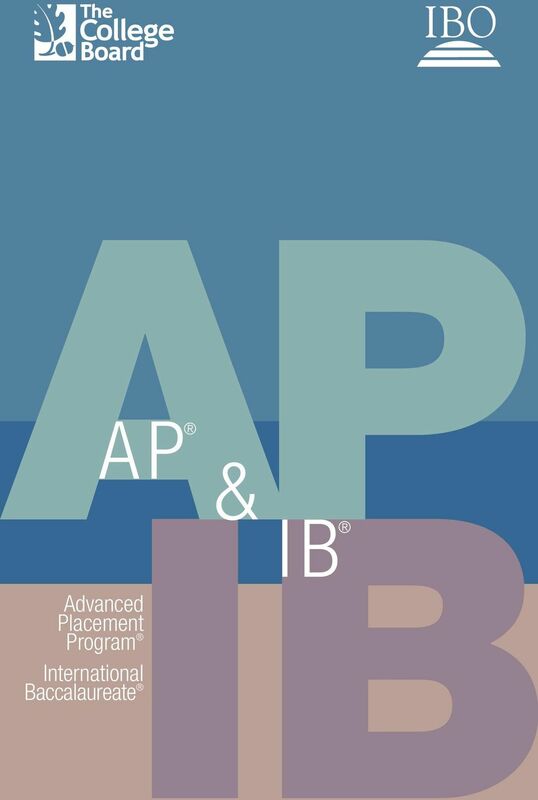 Download "Advanced Placement Program International Baccalaureate"
5 Advanced Placement Program International Baccalaureate 5 How do colleges and universities recognize International Baccalaureate courses and the IB Diploma? 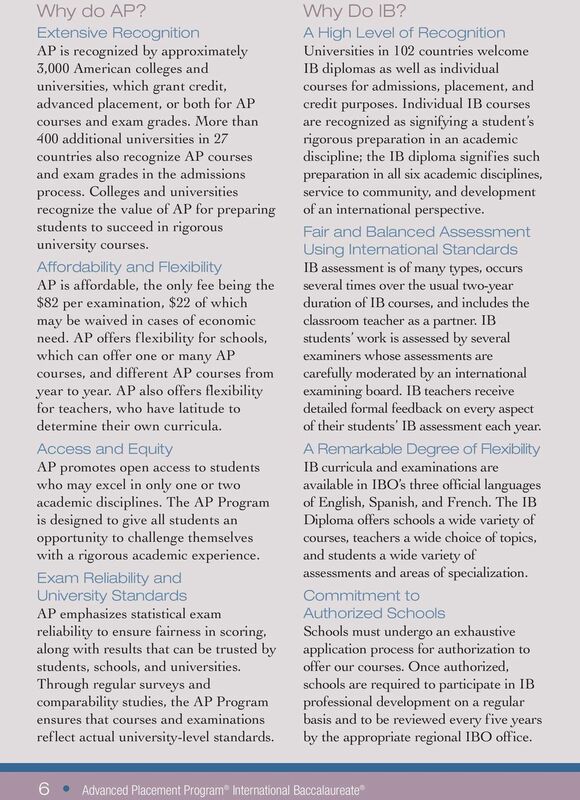 IB has largely succeeded in its goal to be a universally recognized admissions credential. Specific agreements are in place with ministries of education and universities in 102 countries that recognize the IB Diploma as a valid means of earning entry to postsecondary study. The IB Diploma is increasingly being viewed as a strong indicator of academic promise and achievement. 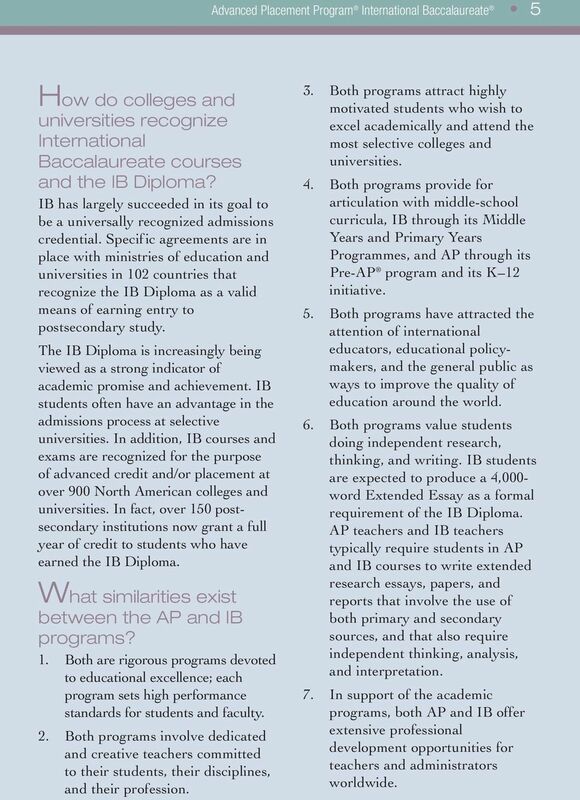 IB students often have an advantage in the admissions process at selective universities. 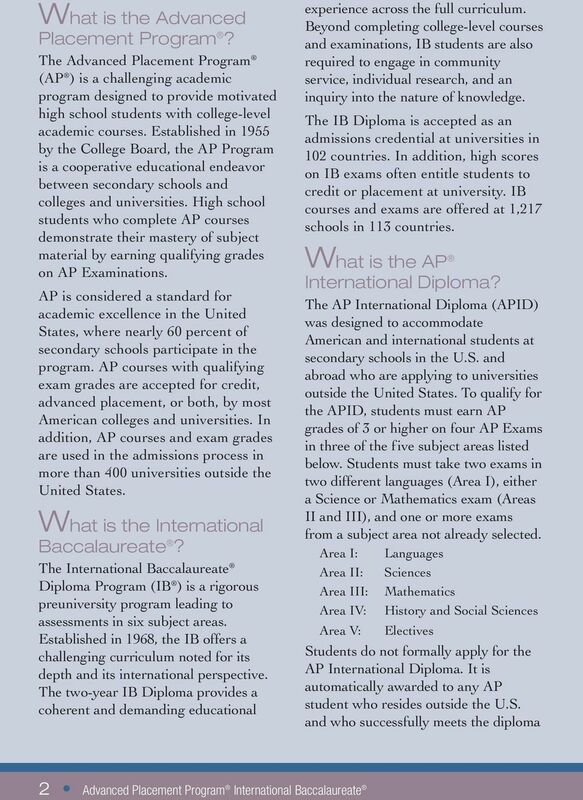 In addition, IB courses and exams are recognized for the purpose of advanced credit and/or placement at over 900 North American colleges and universities. In fact, over 150 postsecondary institutions now grant a full year of credit to students who have earned the IB Diploma. 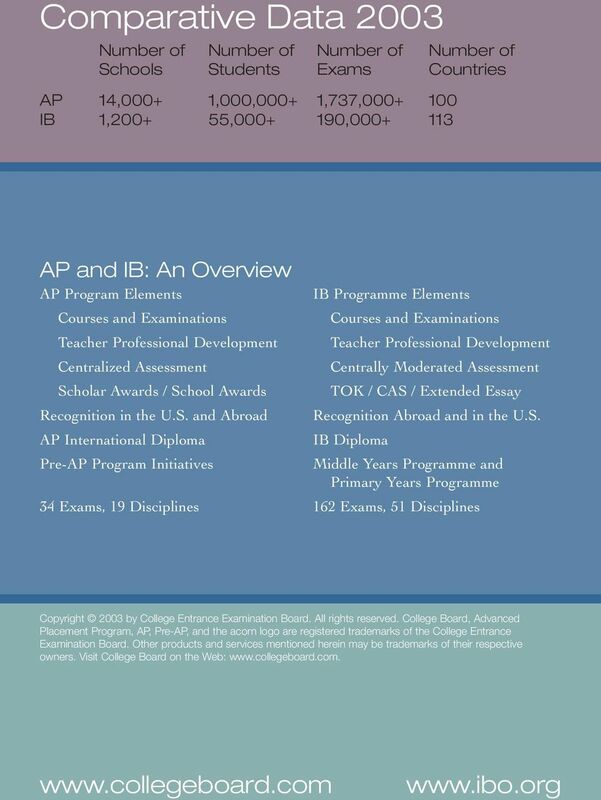 What similarities exist between the AP and IB programs? 1. Both are rigorous programs devoted to educational excellence; each program sets high performance standards for students and faculty. 2. Both programs involve dedicated and creative teachers committed to their students, their disciplines, and their profession. 3. Both programs attract highly motivated students who wish to excel academically and attend the most selective colleges and universities. 4. Both programs provide for articulation with middle-school curricula, IB through its Middle Years and Primary Years Programmes, and AP through its Pre-AP program and its K 12 initiative. 5. Both programs have attracted the attention of international educators, educational policymakers, and the general public as ways to improve the quality of education around the world. 6. Both programs value students doing independent research, thinking, and writing. 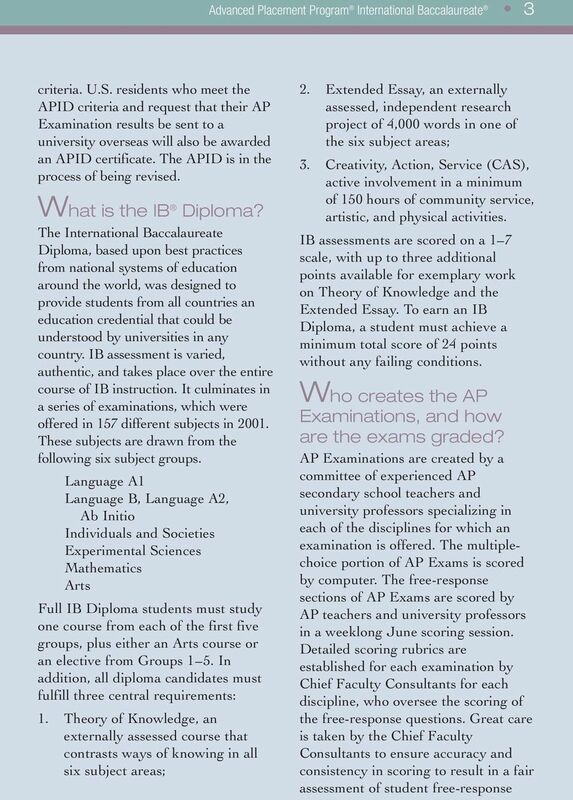 IB students are expected to produce a 4,000- word Extended Essay as a formal requirement of the IB Diploma. 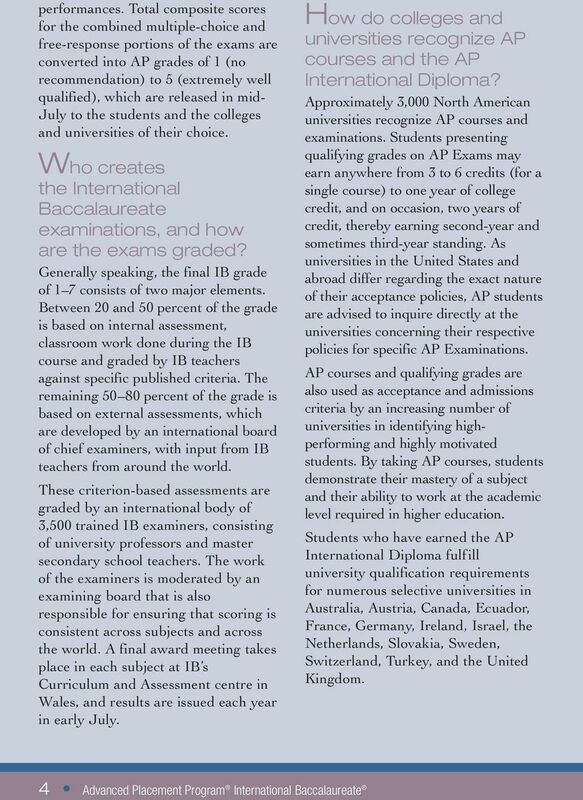 AP teachers and IB teachers typically require students in AP and IB courses to write extended research essays, papers, and reports that involve the use of both primary and secondary sources, and that also require independent thinking, analysis, and interpretation. 7. In support of the academic programs, both AP and IB offer extensive professional development opportunities for teachers and administrators worldwide. 8 For more information about the Advanced Placement Program, contact: Robert DiYanni, phone: ; Bernie Longboy, phone: ; Clay Hensley, phone: ; For more information about the International Baccalaureate Programme : In Europe, Africa, or the Middle East, please contact the IB office in Geneva at In Asia/Pacific and Australasia, please contact the the IB office in Singapore at In Latin America, please contact the IB office in Buenos Aires at In North America and the Caribbean, please contact the IB office in New York at AP & IB The College Board Mission: To be a great educational organization dedicated to preparing, inspiring, and connecting students to college success and opportunity, with a commitment to excellence and equity. 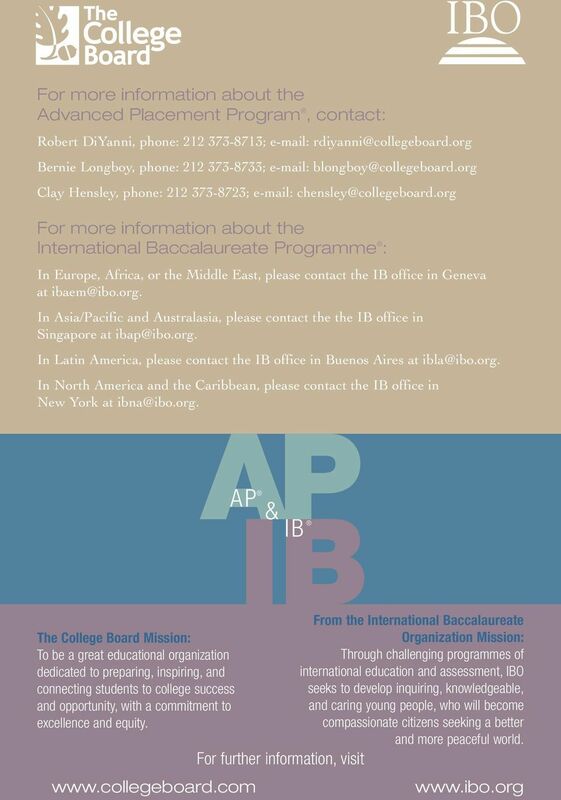 For further information, visit From the International Baccalaureate Organization Mission: Through challenging programmes of international education and assessment, IBO seeks to develop inquiring, knowledgeable, and caring young people, who will become compassionate citizens seeking a better and more peaceful world. \ A / VVhat is the Advanced Placement Program'? The Adwanced Placement Program@ (AP@) is a challenging academic program designed to provide motiwated high school students with collegejevel academic courses. What is the IB Primary Years Programme? What is the IB Primary Years Programme? The IB Primary Years Programme, for students aged 3 to 12, focuses on the development of the whole child as an inquirer, both in the classroom and in the world outside. 3.03 College Board Advanced Placement Test means the Advanced Placement test administered by the College Board and Educational Testing Service. TITLE 133 PROCEDURAL RULE WEST VIRGINIA HIGHER EDUCATION POLICY COMMISSION SERIES 23 STANDARDS AND PROCEDURES FOR UNDERGRADUATE ADMISSIONS AT FOUR-YEAR COLLEGES AND UNIVERSITIES 133-23-1. General. 1.1.